I was back at Amaravati Monastery for a weekend retreat last Friday... a silent retreat! It’s really striking that 53 people come together without introduction, names, accent, or status but purely with the equality of being on the same venture. No one says: "I'm a doctor" and no one replies: “I'm a lawyer... teacher, accountant, carer”. And then the dynamic that you might find in a group where similar people get together doesn't happen. The judging that oils the wheels of society doesn’t take place. Lack of a pronounced self-definition makes for a gentler and perhaps truer connection. This made me reflect on what is called, in yoga philosophy, the Koshas. This is theory that there is an essential self buried under layers and layers of identity, ego and the word ‘I’. Identification with these layers gives a false experience of who we really are. There are five koshas. The first of the layers is the Food’ Kosha - the name for the physical self. If we identify to closely with this ever-changing, ever-ageing self then loss of looks, change of weight or declining health can be devastating. We strongly identify with body image and vigorously resist change to this altering thing. 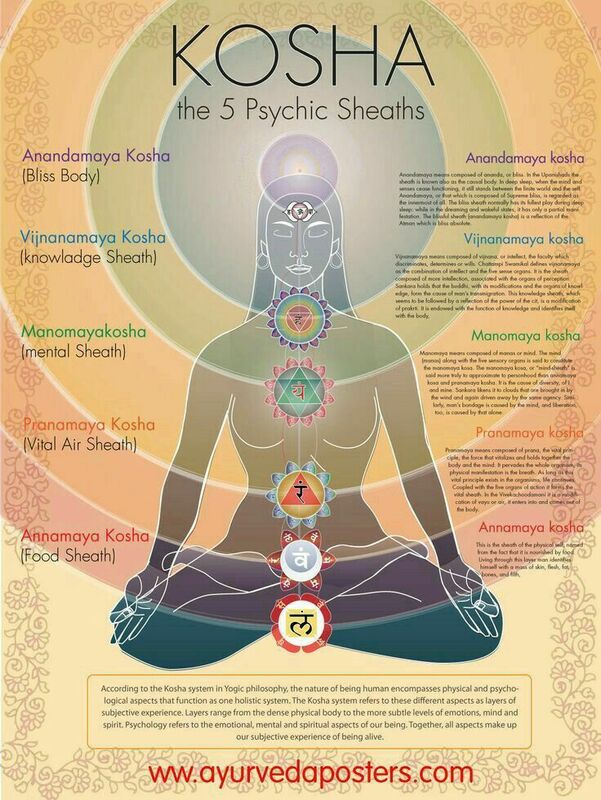 The next one is the Prana Kosha which refers to the energy body. This might be the Yogi’s favourite one: identifying with the promise of vital energy, with moving ‘stuck’ energy, connecting to the energy of others, the energy in nature and purifying oneself through the practice of Pranayama. Big attachment! The next two seem to hint that we’re closer to a truer self; the Wisdom Kosha and the Bliss Kosha. The first is your intuitive self, consciousness beyond thought, where Buddhi nature arises. The second is the Bliss Kosha where the mind chatter stops and a sense of oneness replaces the sense of a separate individual ego. Promising... but these two still involve identification with a layer and is still not the true self. Not easy, eh! However, the experience of getting to know others in silence gives an inkling that we are not the things we tell strangers we are: the profession, the place in the world, the age, the taste in music, and all the other elements we spend a lifetime collecting to make up our treasured personality... the persona... the mask. I bought flights this week and it cost £403. That’s for the return flight on BA from Heathrow to Athens and the Sky Express return flight from Athens to Kythera. You might make it much cheaper by using a budget airline for the part from London to Athens. NB. London flights need to hook up with the internal flight so you might end up needing a night in Athens to make use of the cheap flight! See attached for the Athens to Kythera flight. Details of the retreat are on my website. Valentina Candiani is the second teacher this year. There may be a third! Porto Delfino will be our home. Come with us! There’s no class next Thursday, 18th. If you’d like me to put on a replacement class, I could do Friday 19th at 5.00-6.00pm. Let me know if that would suit you. You can see class availability on my website (which I update often). The latest availability is attached to this email. Ty Landrum for weekend of Ashtanga workshops starts next Friday at 7.30: The Wonder of Embodied Experience at Triyoga Soho. Come with me! Colleano’s classes at Virgin Active Chelsea on Saturday May 18th and 25th at 10.30-11.30. I’m also covering Alain’s 90 minute class at Eden on Wednesdays ay 2.00 till the end of May. Reuters says: Workplace yoga can indeed lower employee stress. Absolutely! “Yoga is one of many approaches a growing number of employers are using to combat stress and improve workers’ mental health” and “usually requires low investment, with minimal equipment”.